Here is a warning to all prospective growers; green beans are quite susceptible to diseases. Just like other fast growing soft leaf vegetables, you have to be on your toes and look at warning signs. Although preventative sprays is the easiest way out it is more expensive. Prudent and effective growers know when and where diseases infect where it reduces yields. Diseases are classified into three basic groups; bacterial, fungal and viral. and halo blight look the same initially. Both cause small 1 mm translucent, water soaked pots on the leaves. 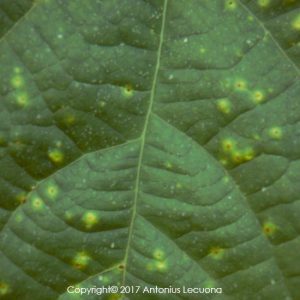 These spots are caused by the bacteria penetrating and invading the stomata of the leaf. Over a short period the leaf tissue between the spots start to die of and turn yellow. The small spots are not isolated just to the leaves. Pods are also infected which has devastating effect on yield quality. 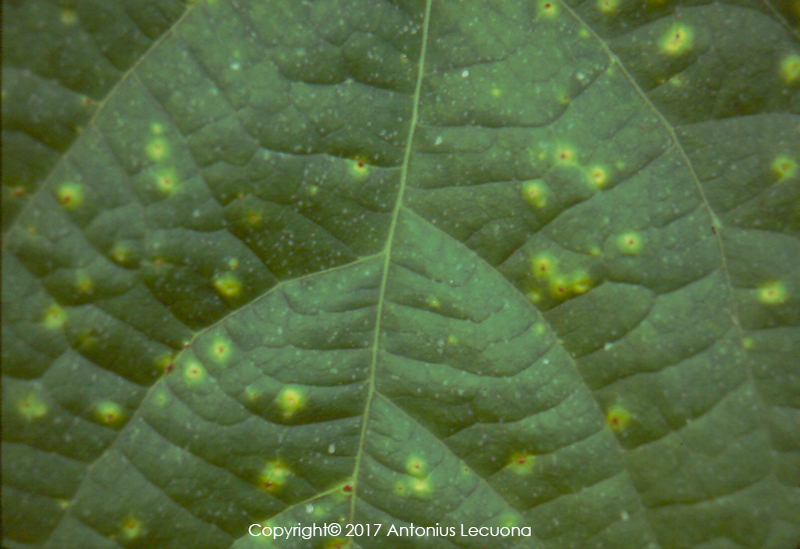 One can quickly identify the spots as a blight due to the red colour of the center of the spots. Common blight and fuscous blight cannot be distinguished by eye. 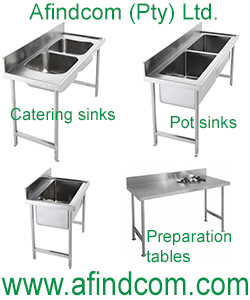 The grower must send samples to a lab for isolation tests. In more advanced stages fuscous blight have a tendency to split stems while common blight does not. Halo blight looks very similar to common blight. A fast way to differentiate is the rate of chlorosis development with halo blight. It is much faster than common blight. The exudate of halo blight is also creamy while common blight is more yellow in colour. Brown spot blight in comparison has the same small water-soaked spots but they become reddish brown in colour. At later stages pale brown halo’s form which are about 15 mm in diameter (0.5 inches). Common blight Xanthomonas campestris pv Phaseoli. Due to the fact that common blight favours high temperatures while halo blight prefers cooler temperatures. So any temperature will do. Blight is either carried with seed or via the air into the stomata where it is spread throughout the plant. Unfortunately some blights give indication of infection by shriveling up, but most other seed give no indication of infection. At the end buy seed from a reputable company. Crop rotation of 3 years is recommended for adequate control in areas where temperatures go below freezing during winter. In warmer climates 5 years is recommended but most likely not economically viable as not many farmers have so much land to spare. The more popular varieties have some resistance to Pseudomonas savastanoi pv. phaseolicola (Halo blight). Please note that resistance to a disease will also depend on the stress levels a plant experiences. 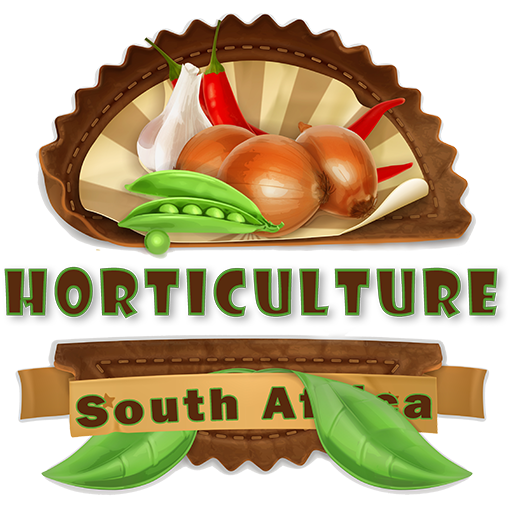 Any temperature range outside the optimum for normal grown will stress the plant and its resistance to diseases will decrease. 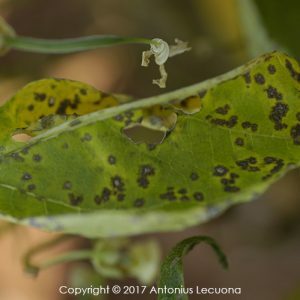 Use copper oxychloride to control blight, however, there are some weather conditions where the blight grows so fast that control is not possible. There are no varieties that are resistant to both common and halo blight. A good practice is to plant two types of varieties each resistant to either blight. In that case if blight starts to infect the crop, only 50% of the plants will be affected. Growing beans in protected environment also does not guarantee that blight will stay away. In a study by JANSSEN (2011) 1)Janssen, D., García, M.C., Belmonte, A., Pascual, F., García, T., Bretones, G., Gil , F.M. and Cuadrado, I.M. 2011. CONTROL OF BEMISIA TABACI AND BEAN YELLOW DISORDER VIRUS IN FRENCH BEAN IN GREENHOUSES BY MEANS OF INTERNAL SCREENHOUSES. Acta Hort. (ISHS) 917:275-280 in Spain it was found that internal fine mesh screenhouses protected the holes and entrances of greenhouses had a significant effect on the occurrence of blight on french beans. The vectors in this case was viruses that spread the disease. No luck for open field production. Bacterial wilt – Corynebacterium flaccumfaciens (Hedges) Dows. – Mostly confined to vascular system. 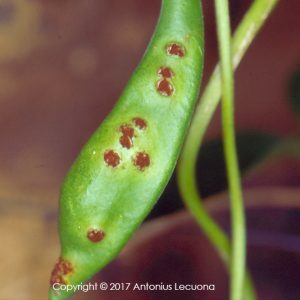 Gall blight – Pseudomonas viridiflava (Burk) Clara. Hardly happens in South Africa. Bacterial Soft Rot – Ervinia carotovora (Jones) Holland. – Mostly a problem in pack houses as it requires very high humidity to grow.